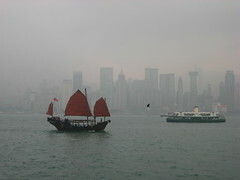 After leaving Manila we dropped by Hong Kong for a couple of days to sightsee. 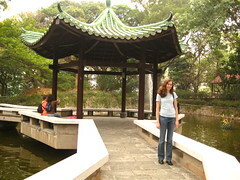 I hadn’t been there since 2000 (and never got to see much at the time) and Amy hadn’t been at all, so we were looking forward to checking out some sights: Victoria Peak, Star Ferry, HK Museum of Art, and of course try some food. That seemed like more than enough for two days. 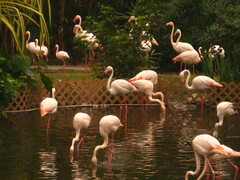 Unfortunately we got a touch of bronchitis on our last day in Manila. 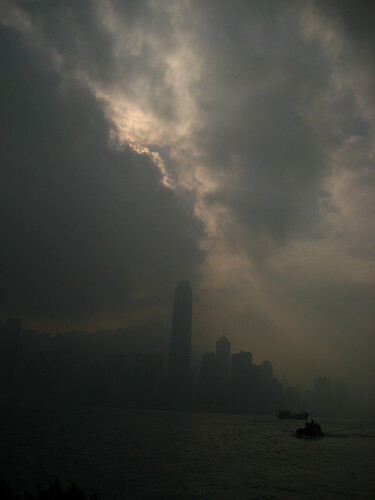 On landing in Hong Kong and alighting from the Airport Express, we went straight to our hotel in North Point to sleep off the sickness. I had enough energy that afternoon to go out and get us some supplies at Watsons, and some beef brisket noodle soup at “YOU ME YOU ME,” a noodle house by the hotel (best noodle soup ever, ordered by pointing at pictures on a menu), but we had not the energy to sightsee, and decided to hold that off till the next day when we felt better. 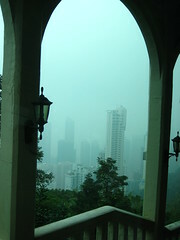 The next day dawned gray and overcast, and the trip to Victoria Peak was shrouded in thick fog. There wasn’t much to see from the top beyond the immediate vicinity of Hong Kong Island, and the anvil-shaped mall at the Peak was a tourist trap (who comes to Hong Kong to eat Burger King and Bubba Gump anyway? ), but we found some decent dimsum and fried rice for lunch at Tien Yi, and the novelty of riding the steep old funicular Peak Tram was quite fun all by itself. 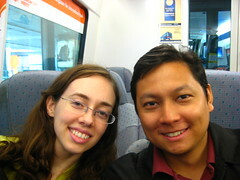 After this we took MTR to Central and got on the Star Ferry to Tsim Sha Tsui in Kowloon. (The actual path to the ferry was a bit hard to find due to lots of construction going on along the waterfront.) From there we were crestfallen to find that the Art Museum is closed Thursdays, so we settled for a walk along the Kowloon waterfront’s Avenue of Stars, taking in the view of the Hong Kong Island skyline across Victoria Harbour. 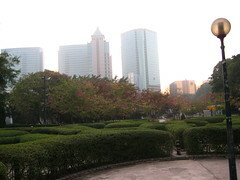 Walking back to the MTR, we wandered through Kowloon Park, enjoying the flamingo pond, hedge maze, and Chinese garden. 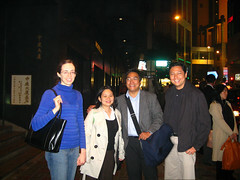 Later that night we had dinner with Louie (an old classmate and friend from Ateneo) and Ginny, who treated us to an excellent Chinese dinner at Yung Kee, the famed roast goose restaurant in Lan Kwai Fong.